Vermicelli or Seviyan is mainly a roasted whole wheat thing that is being used for making kheer. Lightly fried in ghee or butter and adding dry fruits as per your choice, you can make delicious Vermicelli kheer recipe in just 20 minutes. 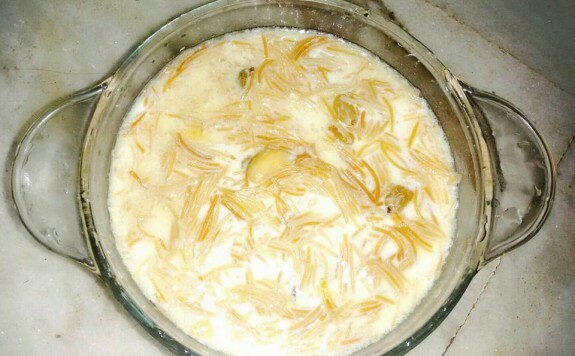 Not only vermicelli kheer but also rice kheer/Payesh is being used for different festive occasions like Dushera, Diwali, Ganesh Chaturthi and many more. 1. Heat ghee or butter in a pan. Add vermicelli and fry till it become golden brown. 2. Pour milk and let it come to boil. 3. Add sugar and cardamom and mix well. 4. Now, lower the flame and let it cook for 5-7 mins till seviyan cooked properly. 5. Now, add chopped almonds, cashew nuts and raising and mix well. 6. Switch off the flame and serve it hot, warm or cold.